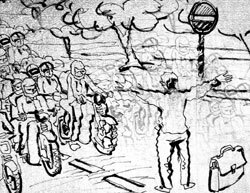 A huge foreigner has stirred public imagination after being featured on VOVgiaothong.vn, the Voice of Viet Nam’s traffic web site. The website released a short clip of the man acting as a traffic policeman in a one-way street. 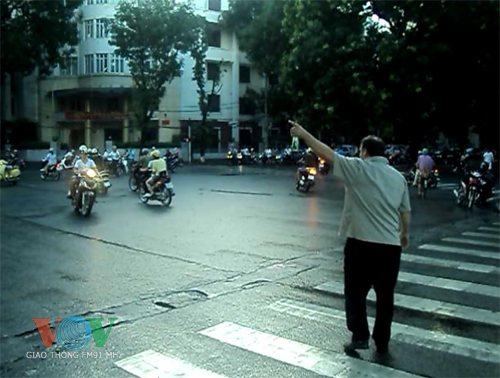 It shows a real scene at the intersection of Tran Binh Trong and Tran Nhan Tong streets in Ha Noi on July 2. When I read this story, the first thought that popped into my head was that a crazy “huge foreigner” (note: I had to chuckle at this description because most foreigners here are “huge” in comparison to the mostly diminutive Vietnamese) had lost it, decided to take the law into his own hands and was making a desperate (and futile) attempt to force Vietnamese drivers to become like those in his home country of Germany. (Having lived in Germany, I can attest to the fact that it is quite orderly but the same applies to the US, at least in comparison to Vietnam.) Was he drunk? Was he on something? Or did he just snap? Most people do what they want when they want to do it. They also do whatever they can get away with and whatever does not defy the laws of physics. (Even those limits are tested sometimes.) It’s “I, me, mine” and to hell with everyone else. Everyone’s a VIP and might makes right, meaning that the hierarchy is determined by the size of vehicle and the risks that vehicle’s driver is willing to take. P.S. : I reserve the right to exercise my right to freedom of speech and occasionally write about non-education-related topics. One connection between traffic, with the large numbers of expensive cars that have appeared in recent years, is that they are a sign of an expanding economy – formal, informal and underground. This, in turn, relates to a growing ability to pay for overseas education, for example.